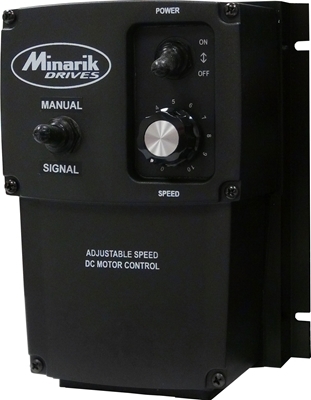 The Minarik Drives Patriot Series provides a reliable and economical solution for variable speed control of permanent magnet or shunt wound brush DC motors from 1/8 to 2 horsepower. Housed in a Nema 4X enclosure, the dual voltage (115/230VAC) Patriot series is ideal for washdown applications and provides protection from corrosive material, windblown dust and incidental contact. Included is power and current limit LEDs, line fuses, inhibit pins for remote start/stop and speed adjust knob mounted on the front cover. In addition, the MC10 model includes an On/Off switch on the front cover; the MC10-R model- a Forward/Off/Reverse switch and the MC10-PCM model- an On/Off switch and a Manual/Signal switch. 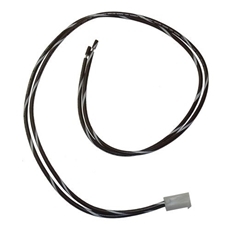 Setup is easy with trimmer pot adjustments for minimum speed, maximum speed, acceleration, deceleration, IR compensation and current limit and a screw terminal block for easy wire connections. 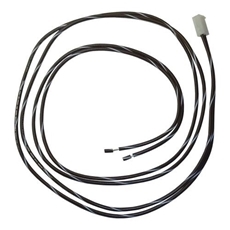 The MC10-PCM model also includes shunt resistor terminals if scaling of the current signal is desired. With a 1% speed regulation over a 60:1 speed range and a plastic NEMA 4X enclosure, the Patriot Series is the perfect solution for many applications that require an enclosed drive.